Last week the Satanic Temple caused quite a stir when it parked 7½-foot statue of baphomet — a satanic figure — in front of the Capitol Building for a couple of hours. Protesters cheered, screamed expletives, and shouted, “Hail Satan” as the statue was unveiled on the back of a flatbed trailer. To be clear, the statue did not stay on the Capitol lawn. It was hauled away after the protest finished. The stunt was part of a rally the Satanic Temple organized to protest Arkansas’ monument of the Ten Commandments. The Satanic Temple had threatened to place the statue on the Capitol grounds if the Arkansas Legislature went through with plans to install a monument of the Ten Commandments. However, the threats never went anywhere, because monuments require legislative authorization; not just anyone can put a permanent statue on the Capitol lawn. However, a few Christians on social media have expressed concerns that the State of Arkansas ought to remove the Ten Commandments monument to ensure it’s never forced to allow a satanic statue on the Capitol lawn as well. There’s no moral equivalence between the Ten Commandments and baphomet. The Ten Commandments are one of the earliest examples of the rule of law in the history of human civilization. They were meant to apply to everyone equally. They helped spawn the idea that people could be governed by constitutions and laws instead of kings. That’s why even secular historians down through the years have recognized the significance of the Ten Commandments. Satanism and paganism did not do any of those things. The Ten Commandments monument that Arkansas’ lawmakers voted to place on the Capitol lawn celebrates the impact and legacy of the Ten Commandments on Western Civilization, and it is identical to a monument the U.S. Supreme Court ruled constitutional in Texas a few years ago. Does baphomet have that kind of legacy in our culture? Did Satan give us the rule of law or the idea of human equality? No. 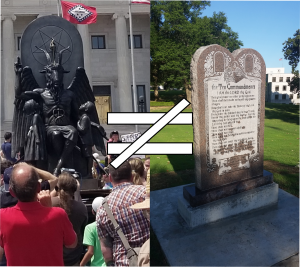 Saying Arkansas’ monument of the Ten Commandments somehow forces the state to put a satanic statue on the Capitol lawn implies that the Ten Commandments and baphomet are somehow equal. They aren’t. One stands for righteousness, order, and the rule of law. The other stands for rebellion, chaos, and lawlessness. There simply is no comparison.